What Is Your Behavior Like Today? 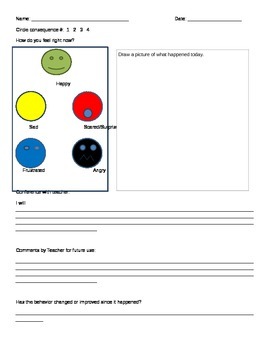 SofieDaysi store-This is a behavior chart worksheet that can be filled out by the child with the teacher. It is supposed to help younger children think about their behavior and how they can improve it They should fill this out after they have been sitting in the thinking chair and had their consequence. Teacher prints off multiple worksheets and places on the left side of the child's folder. Staple one of the 0-4 strips to the folder with a paper clip for the child to move along as they get a consequence. This way it is private and other students can't see how many they have. When you fill out the consequence form, list the child's name, the date, and what consequence they are on. The child should circle how they feel and draw what they did wrong, and say an I will statement such as "I will sit quietly on the rug and listen to the teacher.". Then the teacher writes in what the consequence was and files the paper on the right side of the folder. Each month go through the child's folder and staple the forms to be saved and fill in the area that says if they have improved their behavior. This gives the teacher easy documentation. 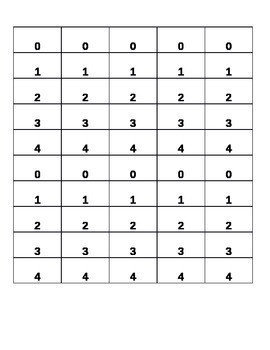 To show parents how many consequences the child had for the day, prepare a calendar with 1 circle in each day box and child will put the number of consequences they had for the day based on what their folder says.